As the software is still in development, we are open to any suggestions you might have. Everything mentioned here is how we imagine the software should look like, but it doesn’t mean that we are right. 🙂 So please feel free to challenge us with your thoughts. The current development of MicroBiz Balance is, I would say, at somewhere between 50 and 60% from the publishing first beta according to our original plan, but depending on your feedback, this plan could change in both directions. Here’s a screen shot of the current product state, the very first time shown outside the office we are working in. It’s not much, but you can see the general layout. 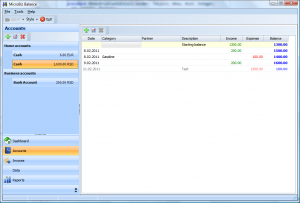 Main areas are Dashboard, Accounts, Invoices, Data and Reports. Dashboard contains list of accounts with current and future balances. Future balance depends on transactions marked as “Plan” (see the grayed out item in the right-hand list on the screen shot). It will also show a glance on important items, such are unpaid invoices, bills and other upcoming planned transactions. You can see Accounts area in the screen shot. At the left there’s a list of accounts grouped by type (Home or Business) with their current balances. On the right, there’s a list of transactions for the selected account (inline editing possible). Grayed-out line is a transaction marked as “Plan“, so you’ll have to do something with it at some point (make it official, delete it, postpone it by changing date). Planned items will be auto-generated when appropriate and included in some reports, so you can easily see what could happen with your finances in the future. Through this area you will be able to create and manage outgoing invoices (and possibly incoming bills, we are still not sure). 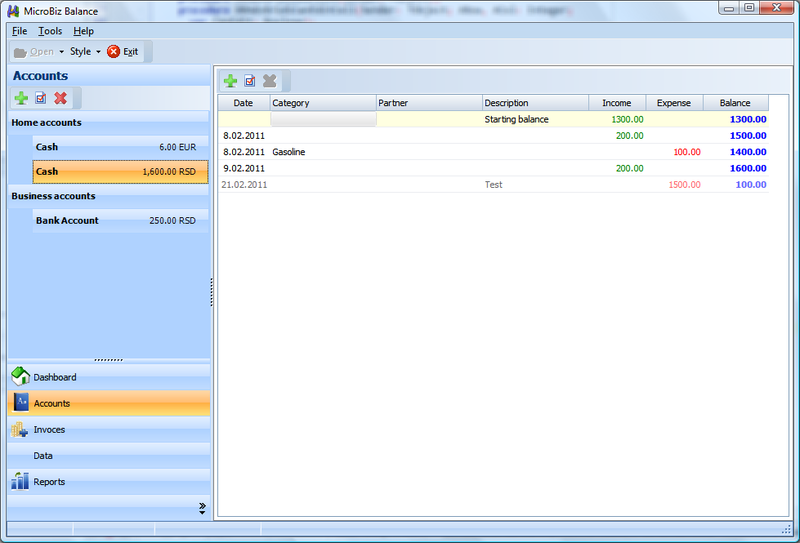 After you create invoice, it will be automatically entered as a planned transaction. We are also giving lot of thoughts about customizing the look of invoices, but that’s a topic for another post. Here you will be able to manage all data that doesn’t belong to other areas: partners, categories, tax rates, invoice item templates, currencies, etc. It is probably clear what this area will contain, but it might be worth mentioning our plans to allow creating custom reports, maybe not for v1.0, but definitely in the future. As with customizing invoice look, it’s a subject for another post. Thoughts? What else would you like to see in the first version and what you consider as unnecessary?